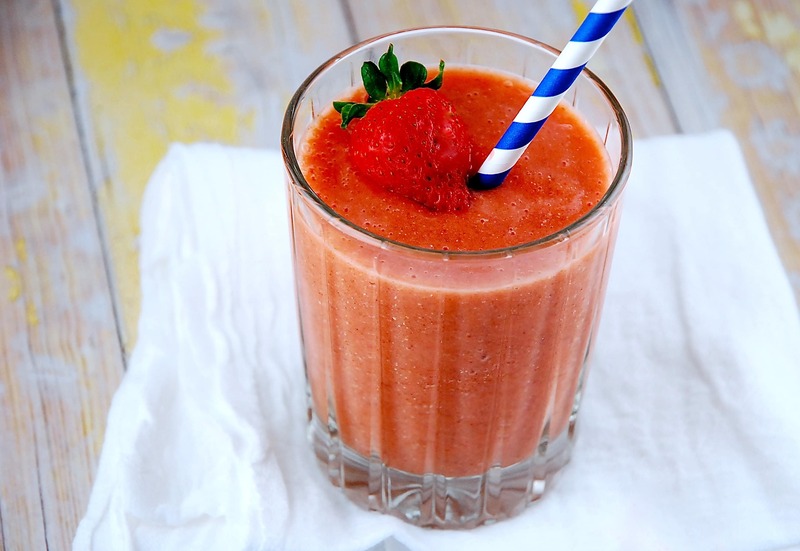 Get a healthy dose of the tropics with this light and easy Tropical Strawberry Smoothie Recipe! I absolutely love this flavor combination, and each serving boasts a tremendous dose of vitamin C and potassium. With no added sugar, and all natural ingredients this smoothie makes a great idea for a healthy breakfast or snack on the go. My kids love this smoothie just as much as I do! I usually prefer to use mostly frozen fruits in this, just because it’s easy, and so I don’t have to add ice to make it cold. Fresh works great too, so no worries if that’s what you’ve got on hand. Each serving comes out to just 2 Points, so you can indulge in a fabulous tasting smoothie without feeling any guilt. Cool and refreshing, this healthy smoothie has all the flavors of the tropics, but with zero guilt. Loaded with vitamin C, it’s a great cold buster too! Blend all ingredients in a blender, and process until smooth. Add additional coconut water, ice, or water to reach desired consistency. Sounds great. But would love to see more single serving recipes. Most wouldn’t have 6 people to drink all this. I can not believe how well the show this smoothie , I can not resist. Tropical strawberry smoothie looks sensational and it is not difficult to prepare . It is the best choice for the morning drink, is a true elixir for health. Oh my but that looks so good. Is 1 cup filling for breakfast though? I suppose with it only being 2 points I can have more or have some egg whites along with. Thank you for doing all this work for us! I have a question. I’m severely allergic to bananas, could I just leave it out, or is there something else I could substitute it for? Thanks. You could just leave it out entirely. Or you could sub in some yogurt or coconut milk, though that will add an extra Point or two, so make sure to factor it in.